The calendar has turned towards warmth and renewal, the Smoky Mountains trails are shaking off their winter drowse, and once again we are headed towards the great spring wildflower pilgrimage. This is an exciting time of year when the trails seem to change on a daily basis. 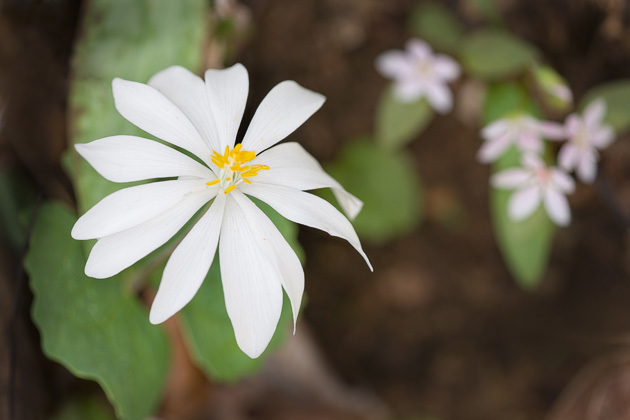 Bloodroot (Sanguinaria canadensis) is a delicate, subtle beauty that blooms in late March or very early April in the lower elevations of the Smoky Mountains. As the bloom is short-lived, the plant is most easily identified by its distinctive multi-lobed leaf. 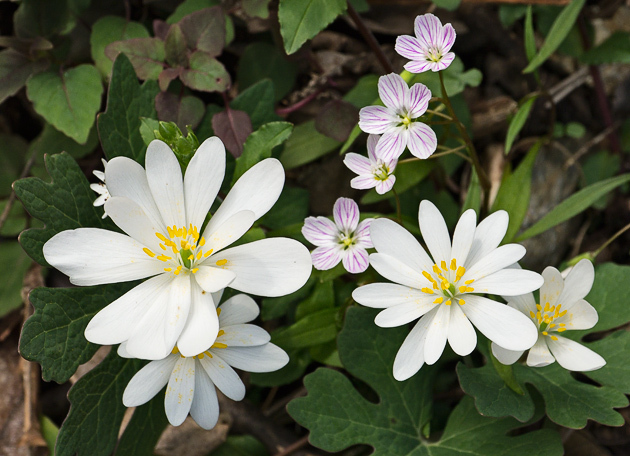 There is a great cluster of Bloodroot near the start of Porters Creek Trail and along the Chestnut Top trail. Look for the bloom to start in mid-March. This wildflower gets its name from the reddish sap found in the root. 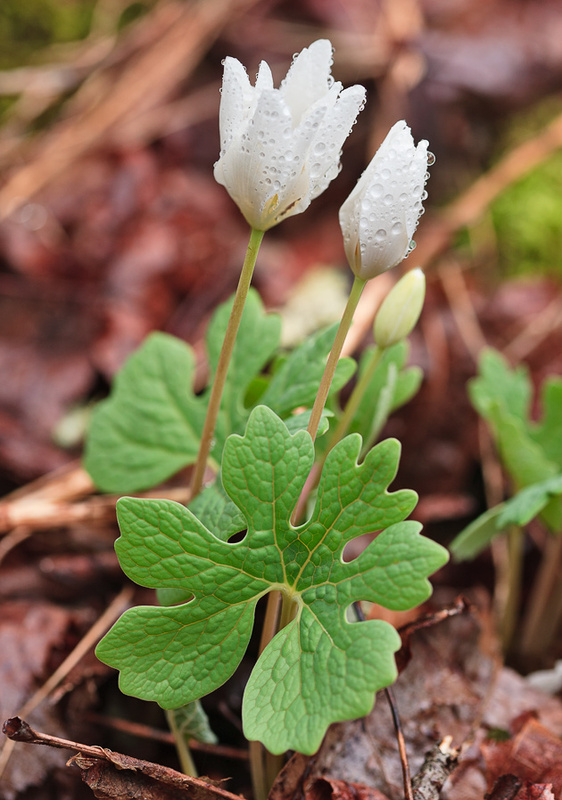 The sap was used by settlers for dye, and was also used as an herbal remedy, although modern knowledge suggests caution for the toxicity of Bloodroot, even for external use. The bloom is short-lived, and will typically not unfurl until the day warms up. The photo above was taken along the Chestnut Top Trail on March 20, 2011. The photo below was found near the Porters Creek trailhead on a cold, wet day that kept the bloom from unfolding. Notice the distinctive leaf in the photo below, that is the easiest way to spot this wildflower. Please stop in and visit me to see the complete display of Smoky Mountain Photography at the William Britten Gallery in Gatlinburg, TN. You can follow William Britten’s daily Smoky Mountains blog posts on Facebook. Click the “Like” button for the daily feed into your Facebook account. Thanks, Bernie … I see you’ve got some Rue Anemone up in Indiana already.